How Far is ASN Elite? Building Structure RCC Framed Structures. Windows 3 track aluminum windows with MS safety grill. Main Door Teak wood door frame with skin shutters. Bedrooms Salwood frames with moulded Skin shutter. External wall 1 coat primer & 2 coats of Apex Paint. All Internal walls Emulsion paint with 2 coats of wall putty. Toilets Anti skid tiles flooring with ceramic tiles dado up to door height in master bedroom toilet. Balconies Anti skid ceramic tiles with water proofing treatment. Living, bedrooms & Dining area & kitchen Vitrified tiles. Wash basins in all the bathrooms, CP fittings of ISI make, Concealed piping system for Cold & hot water with provision for geysers, Porcelain sanitary wares ofreputed brand, WC of reputed brand. Wiring concealed with fire resistant wires, Provision for Split AC in all bedrooms, Adequate points for lights, fans & other plugs in bedrooms, toilets and kitchen with modular switches of reputed brand, Exhaust fans & geyser points in toilets & kitchen plug points for chimney, water purifier, refrigerator and other kitchen appliances in kitchen. Granite coocking platform with stainless steel sink, 2’height glazed tiles daddoing above the platform, CP fitting of Jaquar or equivalent make. Round the clock security, intercom facility with entrance gate from each apartment. Entrance lobby finished with marble / granite flooring, 3 automatic lifts of reputed make & 6 passenger capacity. 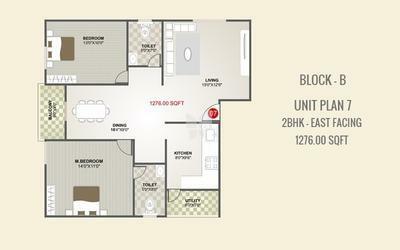 TV point in living & bedrooms, telephone points in living & master bedrooms.